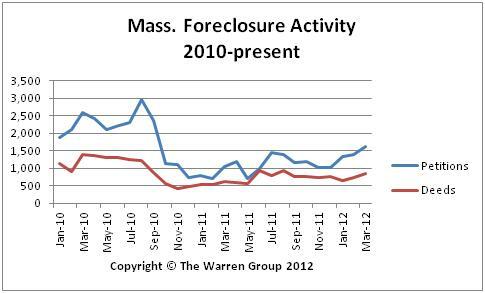 BOSTON, April 26, 2012 – Foreclosure activity in Massachusetts rose significantly during the month of March, according to the latest report by The Warren Group, publisher of Banker & Tradesman. The number of foreclosures initiated by lenders spiked nearly 55 percent from a year earlier. Lenders filed 1,621 petitions to foreclose in March, a 54.7 percent increase from 1,048 in March 2011. A total of 4,348 petitions to foreclose have been filed in Massachusetts during the first quarter, a 71.5 percent increase from 2,535 in the first quarter of last year. Petitions to foreclose represent the first step in the foreclosure process in Massachusetts. Foreclosure deeds, which represent finished foreclosures, also posted a sharp increase in March. Foreclosure deeds rose 36.5 percent to 856 in March, up from 627 in March 2011. Foreclosure deeds totaled 2,254 in the first quarter of 2012, a 34.4 percent increase from 1,677 in the first quarter of 2011.